Department of Pharmaceutical Sciences, Faculty of Pharmacy, Beirut Arab University, 115020 Beirut, LEBANON. Introduction: The world health organization recommends validating medicinal plants to ensure safety and efficacy. Lavandula is valued for the production of essential oil used in aromatherapy. Rosmarinus is known for its folk use as anti-oxidant and antidiabetic. This study aims to design monographs for Rosmarinus officinalis (Linn.) and Lavandula angustifolia (Linn.) cultivated, in conditions similar to their natural habitat, at Beirut Arab University botanical garden. Also screening the antioxidant activity of both plants, and assessing the antidiabetic effect of R. officinalis (Linn.). Methods: macroscopic and microscopic examination, hydrodistillation to obtain essential oils (EOs), thin layer chromatography, Gas chromatography-Mass spectrometry, and physiochemical properties of the EOs were determined. The antioxidant effect of the EOs is determined by DPPH assay. The antidiabetic effect of Rosemary EO is investigated using alloxan-induced diabetic mice. Results: the qualities of studied species are in agreement with the standards described in WHO monographs and in the British pharmacopeia. Composition of the EO produced from either Rosemary (REO) or Lavender (LEO) collected at different months showed differences. The EO of both showed significant antioxidant effects in DPPH assay (p<0.05). In vivo investigation of the antidiabetic effect of REO showed a significant antidiabetic effect in diabetic mouse model (p<0.05). Conclusion: both plant species and their EOs fulfilled most of standards specified by the British Pharmacopeia 2013. Rosemary collected in April (Spring) showed the best antioxidant activity. Lavender collected in September (Early Fall) showed the best antioxidant activity. REO revealed significant lowering in blood glucose level at the dose of 110 mg/kg. Illustration for microscopic examination of powdered Rosemary leaves. 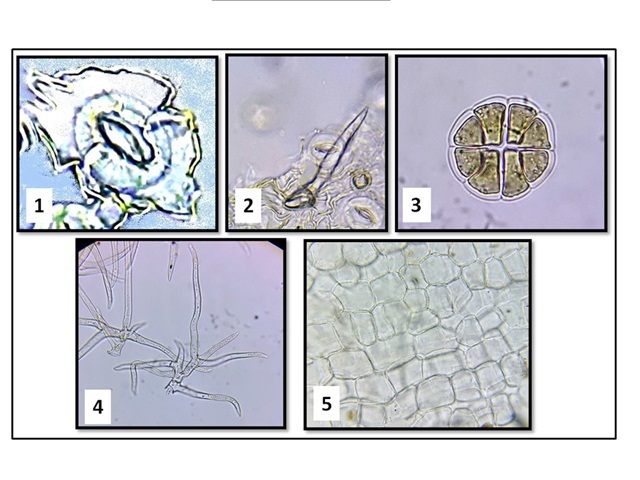 Lower epidermis with diacytic stomata (1); conical shaped covering trichomes (2); labiate type glandular trichome (3); branched covering trichomes (4); upper epidermis of the leaf (5). Koleilat M, Raafat K, El-Lakany A, Aboul-Ela M. Designing monographs for Rosmarinus officinalis L. and Lavandula angustifolia L.: Two Lebanese species with significant medicinal potentials. Pharmacognosy Journal. 2017;9(4):452-474.